You know the way that Superman takes off when he runs: with a whoosh that propels him into a blur in seconds flat. That’s me on my electric bike. At least, that’s how it feels. People look twice when I take off at the lights! OK, it’s not my e-bike. I am test driving it for the day. That’s right. The folks down at Velo electric and folding bikes let you take the e-bike of your choice out to try in your own terrain. I selected the one that the consumer magazine, Choice, told me was the best one, (as first published in RideOn) but I have to say, it was already love at first sight. I walked into the bike shop the other day to ask about whether they were importing the Copenhagen wheel yet (an adaption that turns your pushbike into an e-bike), when my eyes fell on the Gazelle (full name Gazelle Orange Plus X2 Innergy). Elegant, tall (like me), with adjustable handlebars that let me get into a comfortable upright position, all her gears discreetly encased, she looked like the queen of the shop. I staggered back for a moment when I saw the royal price tag ($3,299), but I kept circling until I could resist no longer, and took her out for a 15-minute frolic. I left the shop enraptured, but determined that a few days would cool my heels. Instead, I woke up with her on mind and went to bed to dream about her. I Googled her to see if I could get a second-hand one on eBay – unforunately not. I read the RideOn article again and again. I looked at other bikes, but I kept coming back to the Gazelle. Then I noticed that Velo offered a day-long test drive. I had a good long chat with co-owner of Velo, Paul, about electric bikes and this relatively new part of his business (the e-bike shop opened last November) as he finetuned the gears, pumped the typres and set the seat height and handlebars for the ultimate cycling experience. I rode from the Velo shop in Fitzroy North to my home in Maribyrnong, a journey that I simply wouldn’t contemplate on my 24-gear Giant (a really beaut pushbike). There’s too many hills, and it’s too far for the kind of bike rider I am: none too serious. I like to ride, but I am easily put off by a hill, a headwind, a bit of a detour in order to stay on the bike path, a few spots of rain – that kind of thing. I zoomed down the bike path through Royal Park, gliding up hills with little exertion. I was surprised to find that the e-bike don’t do all the work for you; you do have to peddle. (I thought you might peddle for a while and then rest while you motored. But this bike has seven gears and three levels of assistance (eco, normal and boost), so if you are facing a serious hill, you just move up through the options. It’s still work, but not much. I stopped for a coffee on the way home and discovered I couldn’t work out how to use the on-bike lock, and later at home I struggled to get the battery out and to work out where to plug it in to the charger. Actually, it’s all very easy. The thing to do is to have a go before you leave the shop, and then you won’t have to keep ringing up Paul like I did! After a few hours of work, I decided to try riding up the mega-hill between me and Highpoint shopping centre (affectionately known as “knifepoint” by the locals). I am only mintues away from this shopping sprawl by bike, but I often drive because the hill is off-putting. I can’t get up there on my pushie without dismounting. Up I zoomed on the Gazelle. A guy who was walking down the hill stared (in a good way) as I tootled up the last very steep bit of footpath. No problems! A bit of a workout, but not too hard. Tomorrow, I am going to ride down the Maribyrnong bike path to my office in the city. I can get the whole way off-road, which is great because the traffic in Melbourne is enough to put anyone off cycling. I’ve ridden most of the time with the engine on the normal setting, which uses up the battery faster than eco, but I figure when I regain some fitness I’ll be able to use eco more often. Boost is just for the big hills. I was surprised to find that this bike glides along beautifully even when the engine is not on. It’s a good bike first, then an e-bike. 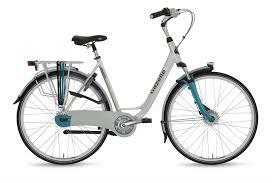 The battery is a sleek silver affair that slips in between the bike rack and the back wheel, and slides out smoothly to come inside for an overnight charge. They reckon it takes about four hours to fully charge. I haven’t got that far yet. The batteries are expensive to replace – I think it is about $600 – but it’s been pointed out to me that amount is about 10 tanks of petrol, even in my little Barina. They are suppposed to last two years. I’d be tempted to go straight for the “gold” battery (bringing the price up to $3,549), which has a longer range (45km to 200km) than the “silver” one, which lasts between 35km and 170km. The range accounts for the different conditions – heavier riders, more hills and so on will use more assistance from the electric motor. It’s so quiet that you have to make sure the pedestrians are aware of you when you come up behind. The bell gives a cheery “ding”, which helps them stay calm as you zip past. What I really love about this bike is that it’s got enough ooomph to tempt you to do the short rides. I have a meeting this evening that is about 2km away from home. I always drive there, but tonight I’ll take the bike (it comes equipped with lights, but Paul advises every night rider to have extra bright lights to stay extra safe). Of course, by the time you add a couple of those essential extras – a good night light, a panier to store any belongings, a kickarse bike lock – the price starts to creep up to the heart-stopping level. Of course, my rego costs $700, not to mention another $500 on insurance before I start filling the tank and paying $400 for a service (if I’m lucky). Somehow I’m just used to forking out big bucks for my car, and small bucks for bikes. I don’t know if I’ll buy it, but I sure as hell want to. If I do get the Gazelle, it’ll feel like a just bought myself a little piece of luxury.